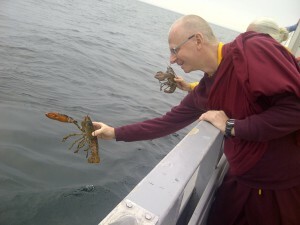 On July 9th Gampo Abbey residents performed the annual lobster release. This involves purchasing (with the aid of donations) the last catch of the season from local fisherman and longtime Abbey friend Captain Mark Timmons and releasing the lobsters back into the water while chanting prayers. We gathered at Pleasant Bay Harbor around 4pm and waited for Captain Mark and his crew to return from their last fishing expedition for 2015. When they docked, we boarded the whale watching boat where the catch (two crates containing about 140 lobsters) was transferred from his fishing boat. The lobsters are kept as close to ocean temperature as possible with lots of ice to ensure that their release back into the water is least traumatic and their survival guaranteed. When we got to the spot of the release, roughly in front of the Abbey, Gelong Loden Nyima performed the blessing of the animals and we chanted the Heart Sutra. Abbey residents, the crew and some tourists who came along each released multiple lobsters. We were instructed by Captain Mark to drop the lobsters tail first into the water in order to minimize the impact. Sparing the life of animals destined to be killed is a practice common to all Buddhist schools, Theravada, Mahayana, and Vajrayana, and it’s known as Tsetar in Tibetan. Recognizing that life is precious and our human birth is the most auspicious, we make the aspiration to make use of our good fortune by caring for all sentient beings. In addition, we realize that causing harm is sometimes inevitable and through life release we gain merit to purify the karma of creating suffering. But that merit is not for our benefit alone, it is dedicated to freeing all beings. And by all beings we mean critters of all sorts, including so-called pests. Basically, if it doesn’t kill you, why should you kill it? Supporting all life to the best of our abilities is one of the guiding principles of monasticism. At Gampo Abbey, which is located in a remote and rural location on the island of Cape Breton, we share our space with many creatures, some less “pleasant” than others. This gives us the opportunity to reflect on our prejudice towards others. Why do we see some beings as pleasant and worthy of compassion and others as disgusting and threatening? Acknowledging that other beings’ happiness is as important as our own, we are also training our mind in overcoming dualistic thinking. What would happen if when I find an ant in the sugar bowl, I scoop it up and put it outside instead of squashing it? Perhaps I can discover a practice of generosity where giver and receiver are one. 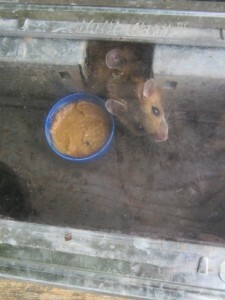 One example of how our community engages with this is dealing with our friends of the mice variety. We have established a successful mouse relocation program that this year alone has provided re-housing for over 250 little ones. The debate is still ongoing whether that is the actual number or if it was just one very persistent family coming back over and over again. Nonetheless, our staff member Janie McGiffin carried on setting the live traps and driving the captives a few kilometers away in an idyllic pasture renamed Mouseville. There are many ways in which we can do this practice individually, without the need to organize the mass releases that various dharma centers do every year. For instance, you can donate to or volunteer at shelters that don’t euthanize animals; you can adopt an animal that would otherwise be put down; you can support any number of wildlife conservation charities; you can be conscious that your animal food products are sourced in a humane way, or avoid them altogether. In recent years, many useful and fertile discussions have been sprouting about the correct way to practice Tsetar. In the past, misguided practitioners have actually caused damage to animals and the environment by adopting erroneous methods. Mostly by releasing animals in the wrong environment, they either caused them to die or created an imbalance in the ecosystem. So it is of the utmost importance to do life release in a way that is in harmony with the local environment. That is why our Abbott V.V. Khenchen Trangu Rinpoche decided that lobsters would be the most appropriate for Gampo Abbey. The important thing is that you set your intention for the benefit of all beings and not for the actualization of some conceptual belief. In a speech on protecting the environment, His Holiness XVII Gyalwang Karmapa Orgyen Trinley Dorje talked about the wider notion of life and suggested planting trees is also a way to do this practice. Instead of running to the nearest pet store and throwing some goldfish in the pond at the nearest park, you can take some time to reflect on what your current surroundings allow you to do. Anything that aims at preserving life counts, so let’s not forget the poverty that affects people in our own neighborhoods. The scope and potency of Tsetar is as limitless as our compassion can be. Once when I was in a long retreat at Sopa Choling, the Gampo Abbey retreat center, I walked down the long wooden outside stairs and approached the front porch, on which sat a small creature with enormous dark soulful eyes. That’s when I learned in a very immediate way the power conceptualizing can have to override direct experience. Thank you for sharing Emma!